Creamy Shrimp Pasta with Cilantro Lime sauce, easier to make whenever you quench of exotic food but simpler to make. Here you will also find how to make this recipe in less than 15 minutes. I generally cook faster and many ask me that how do I able to make it quicker when compares to others. And my answer to them is ‘Planning them ahead and breaking them into simpler modules’. Sounds interesting right? Any cooking can be done faster if you break them into small modules. 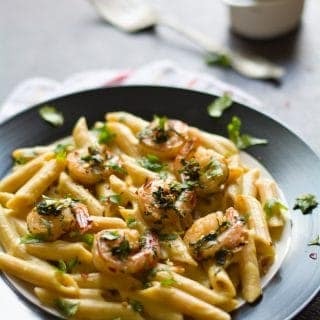 Like in this creamy shrimp pasta recipe which can be divided into three modules. 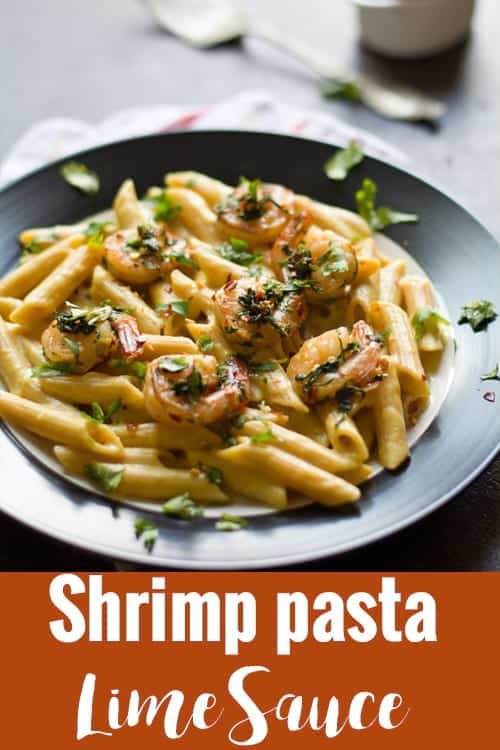 Similarly for any other recipes like Sriracha Shrimp pasta and Shrimp Bruschetta Pasta. I try to make these modules simultaneously to cut down the cooking time almost by half. I switch on three burners all at one time. One with the higher flame to cook pasta for 10 minutes. Another one with a medium flame for cooking shrimp and the last one with simmer flame for making a sauce for pasta. This way I complete making this recipe in 15 minutes. This is how I do it with other recipes as well. This method is easily manageable and everyone can do it as well. 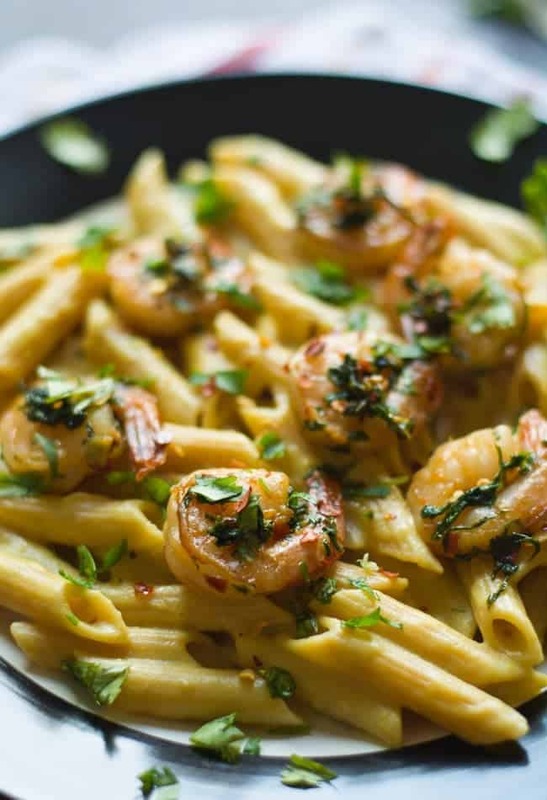 How to make Creamy Shrimp Pasta with cilantro lime sauce. Cook pasta as per the instructions on the package. For cooking shrimps, In medium flame heat a pan. Add cooking oil followed by chopped garlic. Saute it until it changes the color. Add washed and cleaned shrimp and chili flakes. Saute it in the oil for a minute and add water. Allow it to cook completely. After the water evaporates, add chopped cilantro and 1 tablespoon of lime juice. Saute until cilantro combines well with shrimps. For making the creamy sauce, In simmer flame heat a pan. Add cooking oil followed by a teaspoon of chopped garlic. Saute it until the color changes. Add all-purpose flour, stir continuously until it changes its color. Add a cup of milk, salt and allow it cook until it thickens. For Creamy Shrimp Pasta, add cooked pasta. Add grated Parmesan cheese and coat well. Add shrimps and serve immediately. 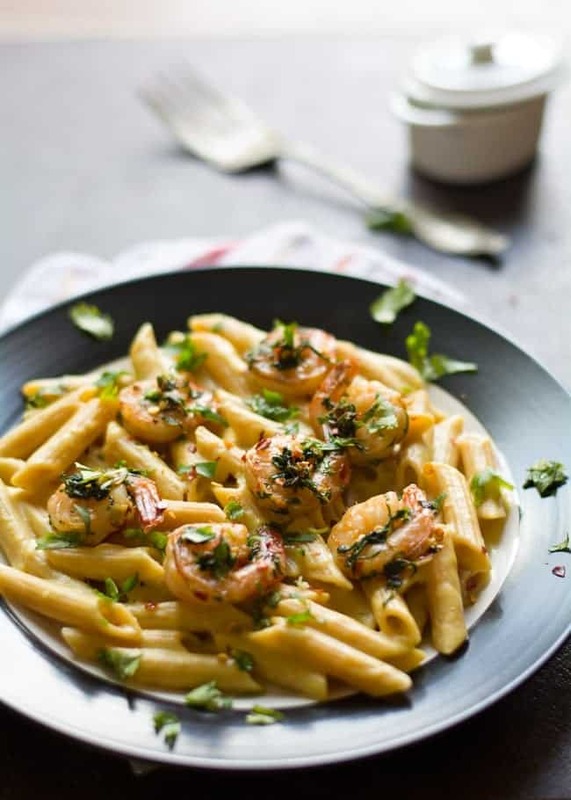 BEST Creamy Shrimp Pasta with Cilantro Lime sauce is an easy, spicy and tasty recipe. Made with milk, garlic, and crushed red pepper. Great comfort food perfect for family dinner. In medium flame heat a pan, add cooking oil followed by chopped garlic. In simmer flame heat a pan, add cooking oil followed by a teaspoon of chopped garlic. Add all purpose flour, stir continuously until it changes it color.